When I left my Skorne army in Seattle after Lock and Load, I knew that I wouldn’t be playing them until they were shipped back, and because I wasn’t in any hurry, I figured it’d be a while. Having purchased and carted the Croak Raiders back to the east coast with me, I figured I’d try and get at least a few games in with them before I jumped back into Skorne, and while I’ll eventually use them in Skorne, I’ve got some plans for what I want to do when I take them out tonight. This is how a confident Ginger starts his game. This is how he ends it. Barnabus survived to kill the Judicator, but lost the war. Last week, I got my third, and final, minions game in against one of our newer Legion players. By newer, I mean has not been playing for 5+ years. Our meta is pretty aged. This fella, though, has gotten pretty good, pretty fast, and is playing some really nasty lists. He’s gone right for the throat, and I cannot be more pleased. I lost the roll, and chose the board edge. I thought the hill would be nice, but it ended up being right in the way for most of my models on turn 1, and out of it the second turn and beyond. I deployed a standard formation, with the ‘Caster in the center along with his battlegroup, To either side I placed a full unit of posse and a Witch Doctor. The Croaks advance deployed and the Ambushers, well ambushed. His deployment was a fairly straight forward up-the-middle for Saeryn, blocked by the house that legion just doesn’t care about. I dropped my AD front and center, again, with a Hunter to either side of the raiders. See, this is where I’m starting to learn a little bit about AD shooting units, and about my deployment in general. I’m not very creative when it comes to getting my troops out, and I need to fix that. Take advantage of terrain, make sure that I get some advantage to my side and deploy with a strategy to take the scenario. Its not my greatest strength. Pre-game, as a whole, is not my strong suit, and I am working on that. So you understand the layout. This is about turn 3. We played destruction, and I wasn’t really ready for it, more than anything. i’d not thought about what Barnabus or any of the gators would want, but I pulled out Arcane Wonder because 1 cost IF is an extremely good advantage to have, and being able to cast it on myself fairly easily would likely be key. His turn two goes exactly like I expect. He jams in with everything, slaughtering everything he gets his blighted mitts on, and causing me no end of trouble. Though Undead, tough, and defense 16, he managed to land a Breathstealer on them, the leftmost unit of wasps into them, and then clean up with Typhon and Zuriel, each killing 2.7 of my 10 Raiders fell that turn, with 0 tough checks made. It is what it is. Thankfully, I have backup in Gators, and he left a few of the wasps outside of his feat. My turn was spent gathering forces and preparing my army to try and weather the storm what was going to follow as best it could. I contemplated using my feat here, but was deterred because I couldn’t knock down the flying models like Zuriel and the Blight Wasps. Turns out, In my haste to use a new faction, I forgot that all those blight wasps could be knocked down, and next turn it would be a fury nightmare. Instead, I just tried to make it as difficult as possible for him to make headway next turn without committing some heavies, who I hoped I would be able to kill. I was able to remove almost the whole of the Blight Wasp unit on the left, but as you’ll note in the picture, that left my entire second unit of gators out in the cold, unable to charge the next turn. His retaliation was swift and brutal, and I really was not prepared for it. 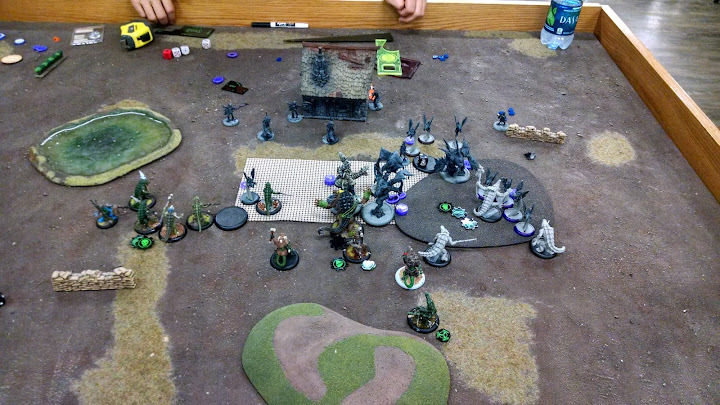 Blight wasps killed a gator, and the Carnevian killed another, all under Iron Flesh, Dirge of Mists, and Tough. My last four croaks died inglorious deaths, having done two damage to the Objective and killed a Blight wasp between them all. The king, though, was the Wrassler, who, under Spiny Growth weathered charges from both Typhon and Zuriel. Thankfully, both of their charge attacks rolled snake eyes and I was able to dodge the bullet. Barnabus, in preparation for his next turn, charged up into Zuriel when he landed and did a pretty significant amount of damage, all the while keeping out of melee range of the beast himself. I started this turn and felt that I had to turn the tide. If I made it through this turn and could take out a substantial portion of his army, I’d be pretty pleased, overall. I brought in the Bog Trogs on the right to try and put pressure on Saeryn and kill some Wasps, and I started the turn by popping Barnabus’ feat, knocking down nearly everything left.I then walked away from Zuriel (who had respawn on him) in order to toss some damage into Typhon, who was under Spiny Growth. I also spent 4 points to heal up the Blackhide, not wanting him to go down to an unfortunate Spiny Growth Damage roll. Sadly, this put Barnabus in a pretty perilous Position (see “FLAG” below), and though I did manage to kill both Typhon and Zuriel, though my bull snapper had to chip in on Zuriel, and didn’t cast Spiny Growth on Barnabus. Indeed, even though I knew that Saeryn had a Grevious Wounds Knife, I still left myself with two fury, enough to have cast Spiny Growth. Not my best of moments. This story looks unfortunate for our Gator Hero, but there is still hope. His paltry def 13 won’t save him, but a solid arm 19 could provide the durability he needs to survive the coming onslaught. Saeryn gets the first crack at him and drops Breathstealer on him, then follows up with a knife, hitting and tagging him with Grevious Wounds. Next, she bottoms out her fury and pegs him with a blast of hellfire, doing 8 untransferable damage. Now, the blight wasps come in, with two getting the charge after shaking off their knockdown. After all the attacks are made – two charges and two buy/boost damate, I am left sitting on 2. The final nail has to come from the Carnivian. He is currently engaged with two gatormen, and in order to see Barnabus, he has to move. He takes the first free strike, which does around 7 damage, blowing out his mind. The second free strike spikes hard, rolling 6/6/5 and doing some 12 damage to the poor fella, and blows out his body. He still has his spirit, though, and can force for boosts. With his spray ignoring in combat bonus, he needs a 7 to hit, and at dice -5, he needs 7 damage to kill me. Its nearly a coinflip, but he drops them both, and poor Barnabus roasts in dragonfire. I thought I had it, and my opponent even said the same, but in the end, what I said would happen, happened. Without Spiny Growth, I didn’t have a chance, but with it, I may have been able to survive. the Blight wasps would have left me at much higher health,and a dice -7 spray from the Carnivian is a much harder task to accomplish. Even with Iron Flesh and Tough, the Raiders were really unable to leverage any sort of offensive output. That is, to be completely honest, my fault. I’ve rarely, possibly never, used an AD shooting unit, and it seems they require much more finesse than at first blush, especially against an army so fast. Me getting them killed, or even simply wasting them, has been a theme in all three games, and I look to make better use out of them when the day comes that I pick them up again. I can see how they are very good, and I know its my inability to use them correctly that is holding them back. Now, though, I Finished painting Zaal right before I went out to Lock and Load, and I look forward to putting the Immortal Host on the board tonight! While I was out at Lock and Load, I was able to pick up a box of Croak Raiders to bolster both my Minions force, and to potentially play with a Skorne caster or two. Acquiring these became even more beneficial when I left the whole of my Skorne army in Seattle, and needed to have it shipped home, something its in the process of as I write this. Without Skorne, which I have been focusing on this year, to purloin my time, I needed something else to play for last weeks game night. With the Croak Raiders in my bag, I pulled them out and hastily assembled them, dojoing lists for them in my head over and over. The Concept here was to have the Gatorman Posse take the brunt of the action until the Trogs come in, have the Trogs overwhelm the edges, and get an assassination via knockdown with the Croak Hunters, and the Raiders. Lurking in the back would be Barnabus and the Spitter, looking to finish out anything causing problems. I was really confident of the concept when I built the list, and though I thought it has some weaknesses, I was willing to move forward into the testing phase of list design. My first opponent was scheduled to be Cryx, which is fine, as I’ve played them myself for an extremely long period of time. There was a predicament, though, in that I know the guy likes to run Incorporeal models, and the list above has no solution ready for them. I pondered the issue for a bit before realizing that I might want to try a bit stronger list against Incorp against Cryx, and that list would be steered by none other than our Gator Queen, Jaga-Jaga. I felt like I was teching, though, and that made me sad. In the end, he and I decided that we were going to bring 2 lists from now on, get better at list-selection. Unfortunately that game was cancelled: I was violently ill and couldn’t make it out to the game store until Thursday, when I met up with some friends of mine at the shop in Bel Air. I was trying very hard to get two games in that day, and I may have pushed my luck a little far, as the first game intruded on the start time of the second much deeper than I would have liked, which made the end of the second game hurry-hurry itself. Next time, I do only one game. First game of the night was against a the newly minted Cephalyx ‘Caster, Cyphon. I lent him both the models and the list, so it was based on the Cephalyx Army i built over the course of months of testing, just swapping out the caster and adding a Machine Wraith to cover the extra point. I knew my second game was going to be against a friend of mine who plays the Protectorate, and has a huge love of both colossals and Feora 2. I knew, almost exactly, what was coming, due to the battle report against him last week. Skarre + Incorp or Denny + Incorp will wreck everything I have, as the only Magical Weapons carried by the army are Barnabus’ Axe, Flesh Eater the spell, and the Gatorman Witch Doctors sacrificial Strike. Cyphon Cannot be knocked down, and has both shield guard and sacrificial pawn to help him live through a withering barrage of Flaming Darts, bu I’ll have to be hitting him at his full def. 13 because he cannot be knocked down. Now, its not a stellar defense, but it is enough to make about 45% of the attacks miss, which’ll keep him alive. Epic Feora is immune to fire, which is extremely good for making sure she survives against the ‘Raiders. Compound that with the Choirs Warding and the Hand of Judgments Immunity to Fire, and I have a caster that I’m not sure I can assassinate. Mostly, though, It was the Revelator, who I was unable to take off the the board without committing Barnabus, I wasn’t really looking forward to eating that one to the face. though each game ended almost how I would have predicted it, the whole experience gave me a chance to sit down and dissect the army and how it works. Sadly, I don’t really know what that gained me in the end, as I feel that the inability of Barnabus to mitigate armor or wounds really created a situation where I was desperate from start to finish of both games. There is a lot yet to figure out with the raiders, and I am pretty sure I am going to be taking them for another spin around the block tomorrow. We will see how that all pans out and whether or not Barnabus can fair any better. When I took off from Baltimore on Wednesday, I was more excited for Lock and Load than I’d been last two years. That doesn’t mean a whole lot because I’m not one to get terribly excited in general. The excitement came from a number of related factors: I was going to see my friends Sarah and Jonathan who I’d not seen in almost a year, I was going to attend the invitational and then Lock and Load itself, I was going to hang with John DeMaris, a stellar fellow I met three years ago, I was going to get games in with Aeryn Rudel, Lyle Lowrey, and Doug Hamilton, and, I discovered at the last minute, meet another set of friends I’d not seen in quite some time. I was also rooming with a bunch of Canadians, only one of which I’d ever met. Not everything turned out as I expected, both for good and Ill, but it was a splendid time all around. What did I do you say? Flying in Wednesday, I managed to have dinner with my friends from Maryland, now Seattle, and it was awesome just seeing them again. They gave me a room to crash in – The only bed I’d sleep in all weekend, good food and good company. Sadly, it was cut short by my stupid east coast brain. I took the train in super-early to get over to the Seattle Westin on Thursday to check in before the Invitational, and from there, met John for breakfast with the Canadians. Check in for the Invitational was super swift, and we got Lock and Load dice, too! Well, the ones I got were “miss printed” with a dark purple on black, but I love ’em, with the color scheme of the Ravens and my Cryx being the same. They are Q workshop dice, but I think they are much easier to read than the standard ones. I’m pleased. My first opponent of the day is Aeryn, who I’d played last year, but he’d been given the wrong warlock by Will Schick, so it wasn’t really a fair game. This year, however, he brought a tier 4 Immortal Host list painted by Charles Foster III, and it was a beautiful army. I was Playing my Exchange Gators, and had finally gotten my Swamptopus from Devilsquid and my Wrong Eye from Endgame. 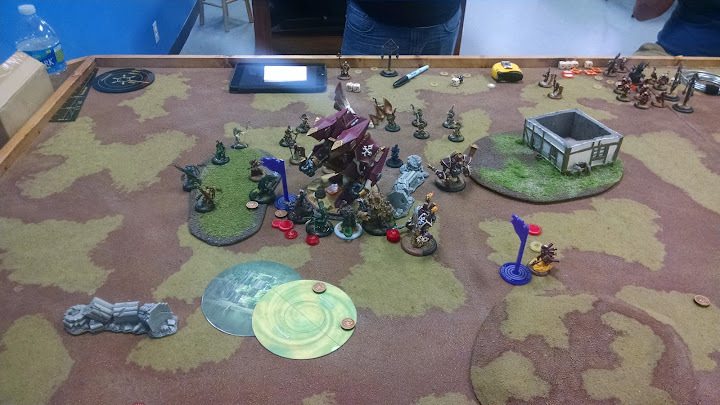 I put down my typical Barnabus list, and we set off on a caster kill. I don’t remember much from this game, other than realizing that the Witch Doc Croc can control the Kovass, and never making the roll. I’m sure the game ended with Zaal in the dirt, and I’m fairly sure it was my Maryland Terrapin that did him in, but hell if I could validate any of that. 1-0 on the weekend so far! The next game was against Kreoss III, who brought along an Indictor, which I’d not seen proxied before. He used the avatar, and that made me very pleased, because who doesn’t want the Avatar to not be the Avatar! I ended up changing the list up (and for the rest of the con, really) by swapping out the Ironback for the Swamptopus. It was a fantastic move that made for some really cool games later on. This one, specifically, I managed to drag Fires of Salvation from engaging two Gators, allowing them to break out and take down some Exemplar Vengers. The Swamptopus, though, Nearly cleaned out fires all by himself, which was pretty epic, getting a 4 point Critical Catastrophic Damage off, making the total 15 points of damage! in the end, Kreoss took three turns of beatings by a Blackhide Wrastler before being put in the ground, but it was finished! 2-0 baby! During the invitational, there was a raffle of sorts, and I was lucky enough to win all the Standard Sculpt Juniors and Lessers, which is a pretty big deal to me. I Have Cygnar, Mercs, Skorne and Cryx, which is just shy of half of them. But now I have to find out reasons to make a Trollblood, Ret, Khador, Protectorate and Circle lists that have them in it. Like I needed more factions. Sadly, I wasn’t able to get in any more games during the invitational, but it was a blast playing Aeryn, which I am going to make a tradition, and my Kreoss Opponent was a great guy. I passed out early, knowing that I had Spelldraft the next day. Well, I Spelldrafted Friday, Which I’ve already wrote about, so I won’t go over it again, but suffice it to say that I thoroughly enjoyed myself. Then, a picture of some unknown Protectorate jack, with a mace, flamethrower, and what seems to be an arc node. Next, Concept art for a Ret Character Warjack. They mentioned if you want to see who’s character jack it is, pay attention to the weapons – looks like Garryth to me. And finally, they showed this still, which could be either Pirates or Cryx. While this slide was up, they mentioned that they were doing characters in Reckoning like they had done before in Apotheosis, supposedly to that type of power level. Its only fair, seeing as Imperatus just released, to keep Ret one step behind! They’d also mentioned that we were going to see some character units, if I remember correctly, and that’s something I’d really love to see. While the Withershadow Combine are freaking amazing, I think Cryx needs another bite at the Black 13th apple! Sadly, the only model I didn’t get a picture of as I was doing all this was the enormous Thexus himself. But lets get to that now! The third game I played was a team game with Doug Hamilton against Team France. 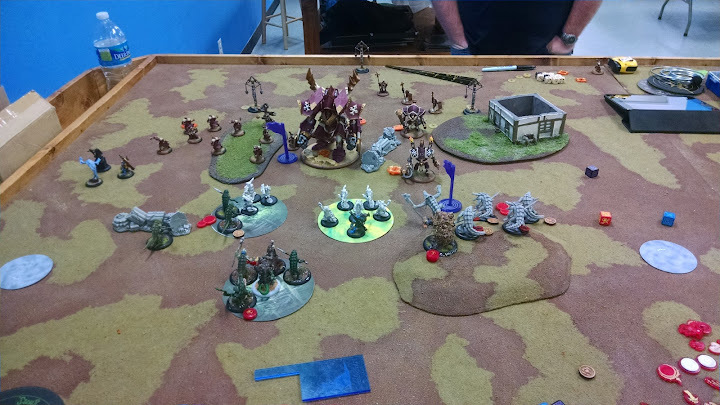 They brought Skorne and Cryx, with Doug and I bringing Cephalyx and Convergence. It was a brutal game, and I rolled my fair share of hard 8’s to bring down most of the Satyxis with the Mind benders. The Drudge unit didn’t last long to the reprisal, and the Warden, when given a chance on Skarre failed to complete the job. Thankfully, He did it on a free strike that saved Thexus’ bacon, allowing us to call the game there up one caster to 0. I even got to use Doug’s Hulk Monstrosities because mine were.. well.. criticized for not being recognizable. I will say, though, that using the feat to clump up all the Venetor Slingers into a nice 5″ aoe bubble and then having the stupid Bloat Thrall miss his shot and sail 6″ right was a real bummer. 9-2! Sadly, my last game of the day I didn’t get a picture of, though it would have been epic. A friend I’ve known for a while but never got a game in against was also at Lock and Load, so we threw down. In the vein of all my Sunday Matchups, he tosses out a legit caster – Saeryn, with a pretty brutal list including a Scythian and two Angels. Standard fare, I’ve been told. Barnabus is good, But I don’t think he’s good enough to tangle with the big boys. Thankfully, I’m able to weather the storm, and make it through the feat turn by blocking LOS to Barnabus with big models in a swamp pit. 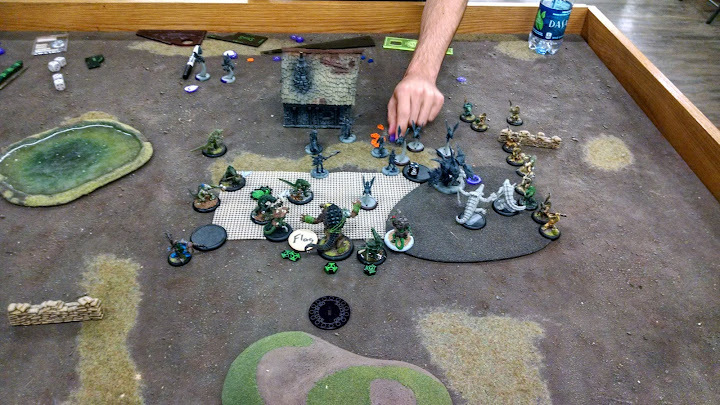 I’m finally able to pop my feat, use Croak Hunter thrown spears to trigger Warpath, and get the Swamptopus on Searyn. Turns out, no girl likes being stuffed into the mouth of Pink Octopus. 11-4! I really enjoyed getting a ton of games in. I couldn’t think of a better way to do it. The food was good, the people were awesome, and the staff was a blast to play against. and also the model, albeit primed, for Jaga Jaga. I had a blast at Lock and Load, and look forward to making the trip out next year. Maybe this time, I can somehow magic my way into an Iron Gauntlet and get beat by the best int he business!